This was taken at 2pm on a Saturday. The line was still ridiculous! 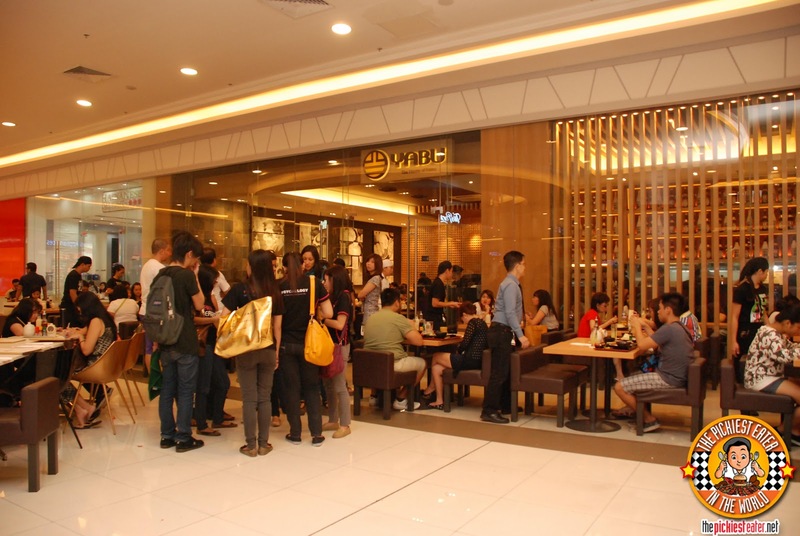 Yabu: The House Of Katsu is easily among the most popular restaurant in the metro today. Even if you try to visit them during off hours, expect that in all likelihood, you'll still be in for a wait. Given their success, one would think that the people behind Yabu would take a few moments to relax and rest on their laurels.. WRONG. Yabu knows that it isn't enough to just be on top.. Its staying on top that truly matters. 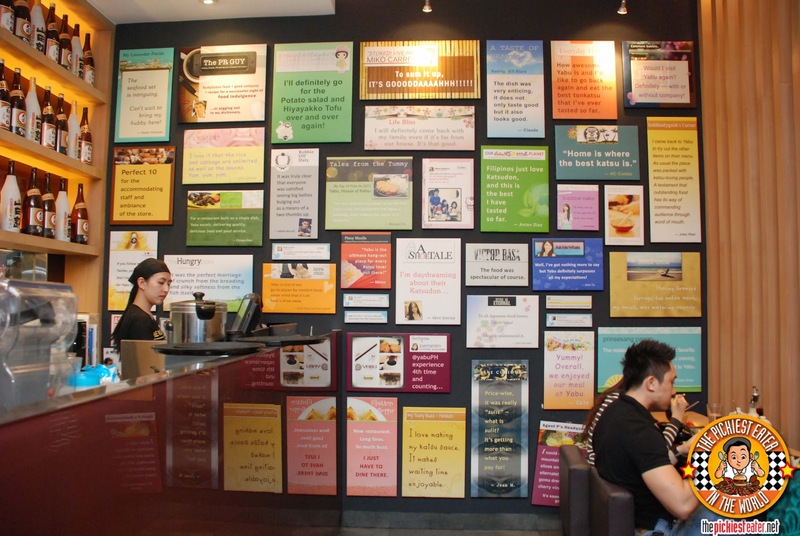 They further innovated their menu, as well as continued to expand, with a total of Four branches and counting! After missing out on the launch of their Mall of Asia Branch late last year, I was absolutely heartbroken, because it also coincided with the release of their new dishes.. Which I got a glimpse of (but not yet a taste) from Chef Lee during the opening of Yabu's Robinsons' Magnolia Branch. This time I was determined to finally get a taste of the three newest Items on the menu of Yabu that have eluded me long enough. It was fun seeing some familiar names on Magnolia Branch's "Blogger Wall"! I wasn't on this one this time, but my friend told me that I have a quote on the wall of the MOA branch. Whenever I go to Yabu, I'm always conflicted with what to order. Not anymore. 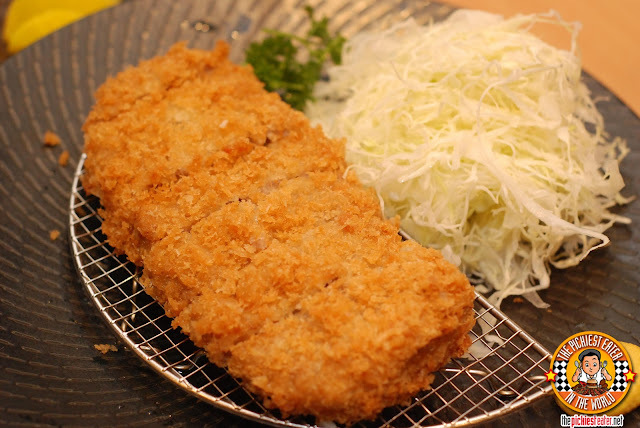 It took all if five seconds for me to declare The Menchi Katsu (P350) my new favorite dish in Yabu: The House Of Katsu. I've tasted almost the entire menu, including their Kurobota entrees, so that speaks volumes of how good it was. The Menchi Katsu is mixture of ground beef and pork, breaded with the Panko crumbs, and deep fried to the Katsu perfection that is synonymous with the Yabu name. The kicker for this was the cheese stuffed in between the meat. The creaminess of the cheese worked absolutely perfectly with the beef and pork mixture, to the point wherein I forgot to dip into the tonkatsu sauce. This seriously blew my mind with every bite I took, and I'm not ashamed to say that I've been having some dirty dreams about it ever since. 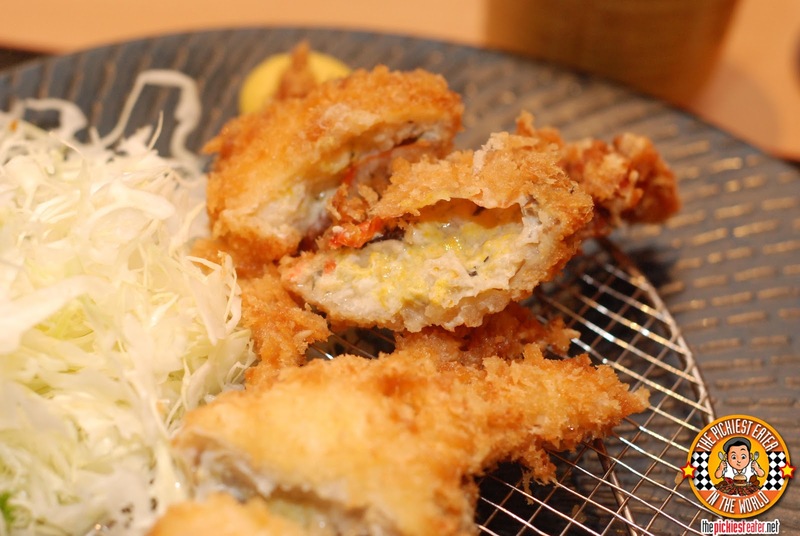 The Menchi Katsu is also available in Yabu's curry sauce, which I already knew was phenomenal from my previous trip. 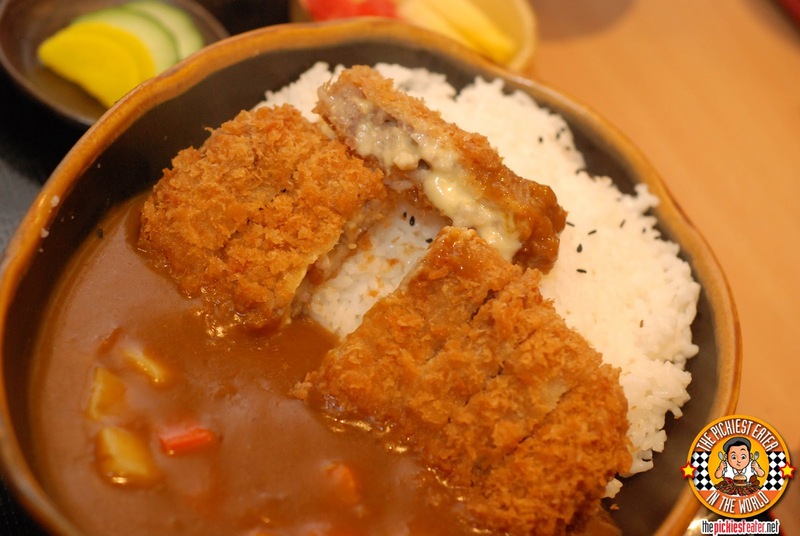 The swirl of aromatic spices became a fragrant coating to the crispy Menchi Katsu Curry (P370). Although the robust flavor of the curry with the Katsu was excellent, I still preferred the original Menchi Katsu set. As I may have mentioned before, I'm not a big fan of crab, so I wasn't expecting much from Yabu's Soft Shell Crab Katsu Set (P480), but Rina went ballistic over it. 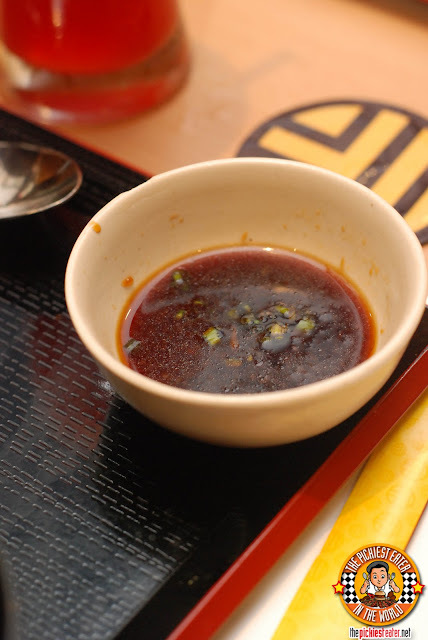 She continued to rave about how The Ponzu-Layu sauce enhanced the flavor of the crab. To be honest, the way she was gushing over it was kinda turning me on, so I decided I had to taste it for myself. I took a bite of the body, and was surprised that It wasn't all that bad. Erika of Yabu, who had joined us for lunch and ordered the Soft Shell Crab Katsu herself, said to me, "You HAVE to try the legs!".. So I did. And gawd dang was it good. The crab legs were so beautifully crusted, it tasted more like chicken fingers than any form of seafood. The thing that I don't like about crab is the "malansa" (fishy?) taste that it sometimes can have.. that was not present here. Once again, Yabu knocks it out of the park with their new dishes. 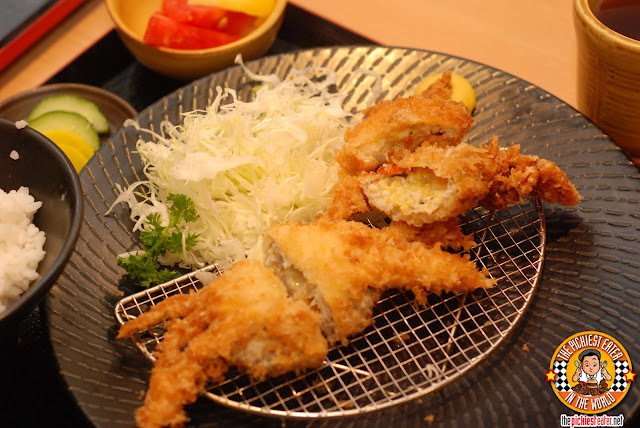 To me, the Menchi Katsu adds a new, delicious dimension to Yabu's menu, and the soft shell crab easily made it to the list of the few crab dishes I eat. 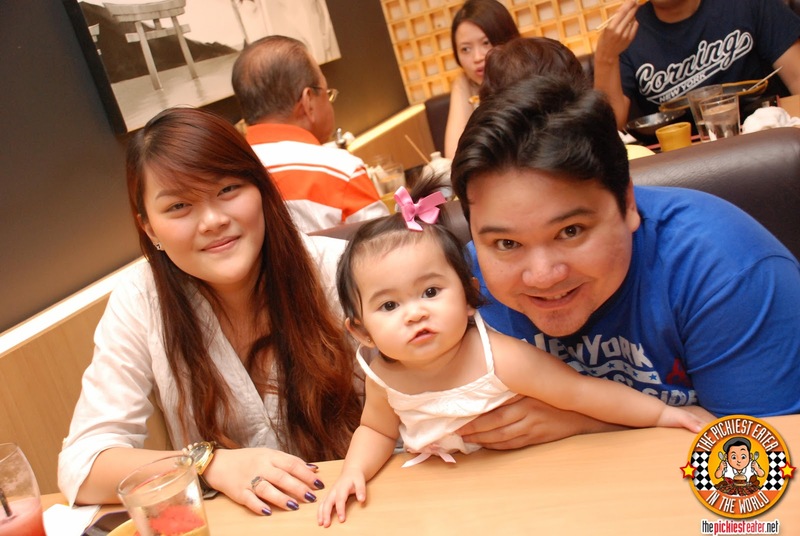 Even Baby Rain had a wonderful time at Yabu, and she finally got to meet Tita Erika, our gracious host for the day! The next time I go back to Yabu, I'm definitely getting the Menchi Katsu again! I love the Menchi set rin!!! <3 Then again, I love almost every Yabu dish hahahaha! I think the only dish I haven't tried is the dory.. hehe.. that's my next target! I just knew you and I would get along just fine! The first time I ate at Yabu, I tried the Menchi Katsu. 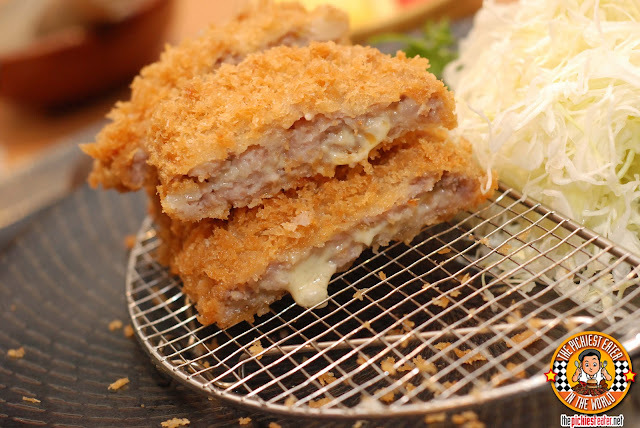 I want to try the larger Rosu Katsu the next time I eat at the MoA branch. I need to go to Yabu on an empty stomach! you can never go wrong with something cheesy + something fried!